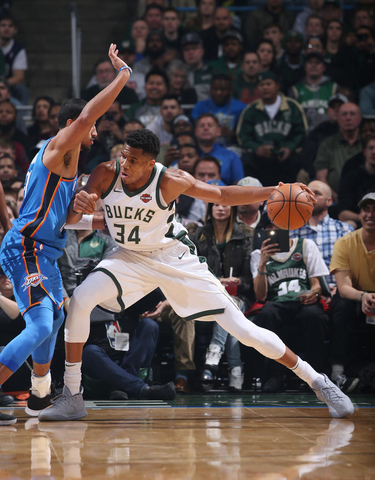 Milwaukee Bucks standout Giannis Antetokounmpo has his team for the upcoming NBA All-Star game in Charlotte on Sunday, Feb. 17. Giannis and Lakers star Lebron James selected their squads on Thursday night, broadcast on TNT. Because James received the most fan votes, he was given the first pick and selected Golden State’s Kevin Durant. Giannis followed by taking Warriors guard Stephen Curry, after Curry selected Antetokounmpo with his first pick in last years all-star game. Antetokounmpo was given the first selection among the reserves and he quickly snapped up his Milwaukee teammate, Khris Middleton. Team Giannis features starters Stephen Curry, Joel Embiid, Paul George and Kemba Walker. There was one trade. After the selections were made, Lebron James offered to trade Oklahoma City’s Russell Westbrook to Team Giannis for 76ers star Ben Simmons. Giannis made the deal. Following is the roster for Team Giannis: Stephen Curry (Golden State), Joel Embiid (Philadelphia), Paul George (Oklahoma City), Kemba Walker (Charlotte), Khris Middleton (Milwaukee), Nikola Jokic (Denver), Russell Westbrook (Oklahoma City), Blake Griffin (Detroit), D’Angelo Russell (Brooklyn), Nikola Vucevic (Orlando), Kyle Lowry (Toronto) and Dirk Nowitzki (Dallas). The roster for Team Lebron: Kevin Durant (Golden State), Kyrie Irving (Boston), Kawhi Leonard (Toronto), James Harden (Houston), Anthony Davis (New Orleans), Klay Thompson (Golden State), Damian Lillard (Portland), Ben Simmons (Philadelphia), LaMarcus Aldridge (San Antonio), Karl-Anthony Towns (Minnesota), Bradley Beal (Washington) and Dwyane Wade (Miami).